Montreuil-Bellay (10 mins) is the last fortified town in the Anjou, retaining almost all of its medieval walls. The earliest fortifications date back to the early 11th century and the present château was added between the 13th to 15th centuries. The neighbouring collegiate church also dates from the 15th century and there are beautiful riverside walks beside the River Thouet. 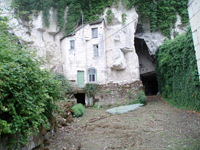 Doue-la-Fontaine (10 mins) has a number of troglodyte sites and amazing trogladite caves. At Doue Zoo, stone quarries have been transformed into a zoo, which takes part in programmes for the conservation of endangered species and is one of the best in the world, often releasing the animals into the wild. The town is also the famous rose-growing centre of France (known as the Rose Capital of France) and has some beautiful rose gardens to visit and a dedicated museum. There is also a Rose Trail, in a magnificent 4 hectare wooded park with more than 10,000 rose bushes. Each year there is a rose festival held with over 800 varieties on display. 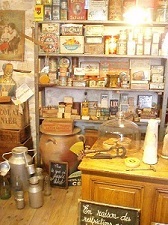 There is also the Musee Aux Anciens Commerces which has a street with 20 authentic shops dating from 1850 to 1950. Louresse Rochemenier (10 mins) This famous troglodyte village shows you how people used to live in the farming village of Rochmenier. Part of the village has been retained as a museum to a way of life that was still in existence in the 1930’s, with ancient farms, houses and outbuildings and an underground chapel carved out of the rock. Saumur (20 mins) is the equestrian centre of France, and home of the Cadre Noir (see below) It is a medieval town on the Loire River, with plenty of things to see and do, including a good range of shops, bars and restaurants. 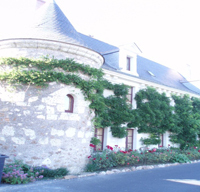 It is best known for its chateau which stands high above the town with great views of the town and river. There are also old colombage houses and a church which dates back to the 12th century. Saumur played an important role in the Second World War, and there is a tank museum and a Cavalry Museum you can visit. It has a number of other museums to visit, including a Museum of Decorative Arts, an Engine Museum, a Mushroom Museum, a Horse Museum and a Museum of Craft and Traditions. Cizay La Madeleine (20 mins) The Abbey of Asnières, is a magnificent building dating from the early 13th century. Even though the nave is no longer there, the choir built in the Plantagenet Gothic style and the transept are preserved. Le Coudray-Macouard (20 mins) This lovely ancient, fortified village has De nombreux manoirs des XVème et XVIème siècles et des maisons de maître du XVIIIème siècle jalonnent les ruelles à l&apos;aspect médiéval.many mansions dating back to the fifteenth and sixteenth centuries lining its medieval streets. Le monde souterrain est accessible à la magnanerie et l&apos;artisanat se dévoile à l&apos;atelier de la Girouetterie. There is also a silk worm farm there you can visit, which La Magnanerie du Coudray fait renaître la tradition de la soie en Anjou, la sériciculture étant importante en Vallée de la Loire à partir du XVIIème siècle avec la création des soieries de Tours sur ordre royal.revives an old local tradition. Deneze-sous-Doue (25 mins) has the Cave aux Sculptures, with hundreds of carved sculptures, and caricature bodies in the tufa rock in these underground caves. Cadre Noir de Saumur (20 mins) is the prestigious national riding school and display team and gets its name from the black uniforms that are still used today. All the instructors at the National Riding School are members of the Cadre Noir. It is unique in Europe, with over 300 horses, extensive stables, Olympic-size riding schools, and miles of specially laid tracks. The horses put on amazing full gala displays of dressage to music. There are also guided tours in the morning when you can watch training sessions and look around the stables. Aubigné-sur-Layon, (30 mins) is one of the ‘villages of charm&apos;, in the lovely Layon Valley, dominated by its fortified castle, and the 11th century church of Saint-Denis. There is also a 17th century priory and a presbytery. It also has lots of flowers and beautiful gardens. Thouars (30 mins) is a medieval city which stands on a rocky outcrop above the river Thouars. It is best known for its impressive Château de la Trémoille, but also has ancient ramparts, old churches, historic towers and lovely floral parks. Massais Parc de la Vallee (30 mins) – is an outdoors family water park and amusement park in the Argenton valley with 30 attractions & activities, including a train, slides, bouncy castles and rides. Gennes: (35 mins) has a rich historical heritage with menhirs and dolmens with the remains of a Gallo-Roman amphitheatre, ancient castles, churches and troglodyte dwellings and mills. One of the mills is the Moulin de Sarré which dates back to the 12th century and still produces flour. Loudun (35 mins) is a historic small town with plenty of charm and character, which was originally walled, but now just a gateway and two towers left standing. It has a Square Tower, built in the 11th century as a fortress. From the top you can see the town’s historic winding streets, slate and tiled roofs and religious monuments. At the foot of the tower, you can visit the lovely Medieval-style gardens. The town also has an aquarium filled with exotic fresh-water fish from Africa, America, the Pacific and Asia, in more than 15 tanks. Candes St Martin (40 mins) is a little port, famous for its abbey, set along the banks where the Vienne and Loire rivers meet, and is one of France&apos;s most beautiful villages where even tropical plants blossom as a result of the sandbanks there being heated by the summer sun, and seeds brought by river boat, the wind and the birds. Cunault (40 mins) The Abbey of Cunault was founded in 847 by monks and in the 11th century and they built a rich Benedictine priory. Only the church remains, with its impressive Romanesque belfry, which was enlarged during the 15th century with a stone spire. A range of classical music concerts and music festivals are held here every year. Turquant (40 mins) is a small village of character, with well preserved, hillside troglodyte caves. This is a charming arts and crafts village where craftsmen demonstrate their skills in workshops where you can also buy the produce created in the troglodyte dwellings. The crafts include glassblowing, stone carving, leaf gilding, jewellery making and leather craft. It is also famous for its pommes tapées (dried, compressed apple) which you can try. Fontevraud l&apos;Abbaye (40 mins) steeped in history the Romanesque Royal Abbey of Fontevraud is one of the Loire&apos;s most popular attractions. Founded in 1101, before the Revolution, the Abbey was the richest and the most important monastery of the Kingdom. The Royal Abbey at Fontevraud is the burial place of the Plantagenet royal family, Richard the Lionheart, Eleanor of Aquitaine and her husband Henry II. A range of classical music concerts and music festivals are held here every year. Le Thoureil (45 mins) This pretty village thrived in the nineteenth century, as a result of the wine and other goods transported along the River Loire. It has beautiful buildings including lavish mansions built in the late nineteenth century by wealthy Dutch and English wine merchants who set up trading points, transporting their wines to Nantes and further afield The mansions had towers built so that the merchant owners could watch their goods going along the river. Allonnes (45 mins) The Parc Maupassant de Bois Savary is a great example of the French formal style of garden with parts of the garden dating back to the 15th century. It has a rose garden, many magnificent water features and a superb collection of peonies and dahlias. The garden also has an amazing potager (vegetable gardens) with the vegetables grown in a series of formal patterns and includes lots of ancient and forgotten varieties. 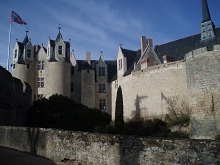 Montsoreau (50 mins) At the heart of the Regional Natural Park Loire-Anjou-Touraine, this is designated one of the “Most Beautiful Villages of France, and a Little City of Character”, with its châteaux , troglodyte caves, wines, mills, mushroom farm and the Park House. In the summer it also has concerts and a regular flea market. St-Mathurin-sur-Loire (50 mins) has”La Maison de Loire”, an Interpretation Centre which allows adults and children to learn more about the secrets of this amazing river, including its history, its natural environment and flora and fauna. Saint-Rémy-la-Varenne (50 mins) At the end of a courtyard enclosed by a wall with a portcullis, near the church, stands a picturesque building with Gothic and Renaissance architecture, founded in 929 and once a Benedictine priory. In the great hall, there is a huge carved fireplace and a mural next to it dating back to the twelfth century. By the fourteenth century it had become very prosperous from farming and pastoral activities, and fees on vessels transporting goods and people across the Loire. Saint Lambert du Lattay (55 mins) is where the Museum of Vine and Wine of Anjou is located in the heart of the vineyards of Anjou and Saumur. Housed in an old cellar, the Museum of Vine and Wine of Anjou describes the evolution of viticulture since the nineteenth century until today. You can discover the work of the vineyard throughout the year and the secrets of viticulture, winemaking methods and the wines of Anjou and Saumur. Chemillé (55 mins) Le Jardin Camifolia is an apothecary garden with more than 800 medicinal plants. It has been cultivated for decades with aromatic, medicinal and perfumed plants. Its name comes from Camiliacum”, which reflects the Gallo-roman origin of the town of Chemillé and “Folia” meaning leaf in Latin. Chinon (55 mins) is a town famous for its wine and rich in history. At one time it had three important castles, but unfortunately they are now in ruins. Here, Joan of Arc met the King Charles VII, Knights Templar were kept prisoner, King Henry II of England died, and also where Richard the Lionheart was born and died. Angers (60 mins) the former capital of the historic Anjou region has numerous attractions including its 13th century chateau, the tapestry of the apocalypse, the 12th century cathedral, a number of interesting museums and lots of shops and restaurants. It has become known as ‘Europe’s Most Flowered City because of its gardens and arboretums, including the world famous botanical gardens. Ouistiti, Beaucouze (60 mins) Indoors and outdoors amusement park, suitable for children up to 12 years and including an indoor softplay centre which is great if the weather isn’t good. It has fun and educational activities, in a secure environment including an area with jungle themes. Terrabotanica, Angers (60 mins) is the first European theme park to be entirely devoted to plants, with more than 1,100m² of gardens, plants, greenhouses and water features . It is entertaining and educational, and has 40 attractions and animations with cinemas, games, shows and, theme trails. You can discover the plant world from every angle (history, geography, economics, symbolism, science and aesthetics). Anjou Adventure Park, Ecouflant (60 mins) It is situated in the Forest of Ecouflant and offers a range of above ground forest adventure trails where you move from tree to tree using monkey bridges, nets, Tarzan jumps etc. It is great for families and there are forest courses laid out with different degrees of difficulty for adults and children of different ages. Maulevrier (60 mins) Parc Oriental Maulévrier is over 100 years old and the largest Japanese garden in Europe, centred around a large lake with bridges, pagodas and a typical Japanese style trees. www.caves-aux-moines.com - Troglodyte restaurant and snail breeding caves.